14.1 Tribhuvan University (TU) affiliated Bachelor of Dental Surgery colleges list. 14.2 Kathmandu University (KU) affiliated Bachelor of Dental Surgery colleges list. Dentistry is a profession related to the health problems like teeth, mouth, gums and other hard & soft tissues of the oral cavity. 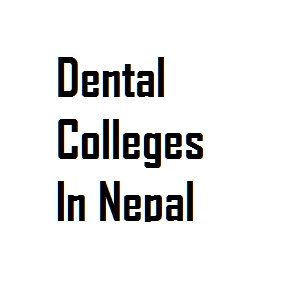 There are numerous dental college in Nepal. Dentist is one of the emerging professions in Nepal related to dental care and correction. In recent days, people are being conscious about their health related to teeth, gums and oral cavity. So, they go to the dentist if they have any problems in their mouths and teeth. It is a duty of a dentist to help the patient to maintain their health. Many dentist colleges in Nepal are affiliated with Tribhuvan University, Kathmandu University and CTEVT. If you wish to study in scholarship, you can get Kathmandu University Scholarship for Nepalese to study dentist in Nepal. College of Dental Surgery, BPKIHS has come into existence on August 1999 as a pioneer of Dental Education in Nepal. The College is committed to contribute towards providing dental surgeons who are knowledgeable, skilled and compassionate, and at the same time equipped with leadership and teaching abilities. This College is also providing quality oral health service to the people of Nepal considering health statistics and national health policy of Nepal. The College was started at previously existed old buildings located at south point of campus with 74 dental chairs with all minimum requirements. The College shifted to its new building on 7th February 2004. Area allotted for the College is 6.77 hectares and total build up area is 120000 Sq. ft. The building has all infrastructures which are required for smooth functioning of a dental college and hospital. We believe this hospital is a model dental college and hospital of this country. At present the college has 131 dental chairs with all other major equipments like OPG, RVG, IOPA, Phantom heads, Central Air Compressors, LP Gas supply unit etc. It was established in 1999 with an aim to contribute towards providing dental surgeons who are knowledgeable, skilled and compassionate. It has been providing quality oral services to the people. It is one of the model dental college and hospitals in Nepal. Kantipur Dental College was established in 2007 with an aim to provide world class dental education and service in Nepal. The college has been offering Bachelor of Dental Surgery (BDS) program affiliated to Kathmandu University and is recognized by Nepal Medical Council and Ministry of Education of Nepal Government. Kantipur Dental College is committed to contribute significantly in the overall health care and development of the country as a responsible institution. It was established in 2007 to provide world class dental education in Nepal. It has been offering Bachelor of Dental Science affiliated with Kathmandu University. It is approved by Nepal Medical Council. People’s Dental College and Hospital was founded in 1997 with the objective of making available up-to-date training facilities to become qualified dental professional and to help meet the country’s growing health care requirements. People’s Dental College Hospital is an autonomous college and is proud to be the first dental college in Nepal under the jurisdiction of Nepal Medical Council and registered with the Ministry of Education,Government of Nepal. It functions independently under the affiliation of Tribhuvan University, the first and the oldest university of Nepal. Nepal Dental Association has honored this institute by conferring its Associate membership for the relentless contribution it made in the upliftment of dentistry in Nepal. It is the first dental college in Nepal under the jurisdiction of Nepal Medical Council. It is registered in Ministry of Education, the government of Nepal. It was founded in 1997. It has two massive buildings for clinical, academic and administrative pursuits. The national statistical data shows the availability of the dental surgeons is very low as per to their demand. So, in order to fulfill this deficits the founder are inspired to come up with the concept of establishing Mahabir Prasad Brij Lal Kedia Dental College affiliated to Tribhuwan University at Birgunj to fulfill the void of not having any specialized Dental Care Hospital in a radius of 200 kilometers and ultimately of the whole terai region of Nepal.The college is well-known in Nepal and abroad as an institution for dental education. The college always puts its effort for the assurance of high level of quality and maintenance of standard against national and international grounds. It is one of the most renowned centers in the field of dental education in the Terai region and ultimately Nepal. It is a private college dedicated to provide quality dental education in Nepal through its teaching hospital and research center. Many national and international students have been pursuing their career through this college. Samaj Dental Hospital, situated at New Baneshwor, established on 16th July 2001, is a reputed dental hospital in Kathmandu. This hospital is approved by the government of Nepal. Since its inception, this hospital has been providing affordable, prompt and quality service to people. Along with clinical and community dental services, this hospital has been running 3 years certificate level academic program in dental science ( dental hygiene course) in affiliation with CTEVT/Government of Nepal. It has been offering MBBS and BDS with modern infrastructure and amenities to the students. It has well-equipped Laboratories, Modern Library, Separate Hostels for boys and girls under the strict guidance of Wardens and 24 hours Security, availability of UCMS Teaching Hospital to the Students for Clinical teaching etc. It was established in 2006 with an aim to be the reputed medical college in national and international level. It runs 300 bedded equipped hospitals with modern infrastructure facilities. It has well-equipped lecture halls, seminar rooms and basic medical science practical laboratories as per the norms of Nepal Medical Council (NMC). It is one of the well reputed medical colleges in Nepal. It houses the academic buildings, library, female student and male student hostels and Nepal Medical College Teaching Hospital (NMCTH). It teaches its students in respective wards and departments. It has well facilitated lab and library. It launched its MBBS program in 2001. It has large physical and infrastructure facilities including 7 various departments with required number of laboratories, lecture halls (including PBL classrooms), audio-visual facilities (media tech), and library with 24-hour internet facility. It is affiliated with KU and fully recognized by Nepal Medical Council, Sri Lanka Medical Council, General Medical Council of Great Britain (UK) and is enlisted in the Educational Commission for Foreign Medical Graduates of USA (ECFMG), WHO ‘s World Directory of Medical Schools. It admits a total of 150 MBBS students yearly. It was established in 2007 in Biratnagr and till now, it has been providing international standards of medical education. It is affiliated to KU and fully recognised by Nepal Medical Council. It has a 620 bedded hospitals on its own and planning to expand to 700 soon. It was established in 2000 affiliated with Council for Technical Education & Vocational Training (CTEVT) with the new training course of “Dental Hygienist ‘’. it fulfills all the physical, technical and academic requirements to conduct the course of Dental Hygienist. Himal institute of dental science was established in 2008 with a motive of producing qualified dental man powers to bridge the gap between the dental service providers and those who need services. It offers the course in the certificate in Dental Science. It is recognized by Nepal Health professional council. BDS colleges of Nepal affiliated with TU, KU. Tribhuvan University (TU) affiliated Bachelor of Dental Surgery colleges list. Kathmandu University (KU) affiliated Bachelor of Dental Surgery colleges list. If you find some Bachelor of Dental Surgery (BDS) colleges missing, please comment below so that we can update it as soon as possible. Since there are many hospitals being established in the country, probably, there are huge employment opportunities for the dentist. They can work dental departments in hospitals, nursing homes, dental clinics and health departments as well as teaching departments in dental colleges. They can also work in the Research and Advisory functions of a pharmaceutical. They can work in companies producing oral care products and medicines like toothpaste, mouth wash, gum care products, etc. They can go for self-employment by gaining some experiences. If you are willing to pursue your further career in BDS, then here are the list of colleges that offers BDS course in Nepal.